Of all the Hindustan Pencil Co. pencils I've used so far, the Apsara Absolute has been my favorite. 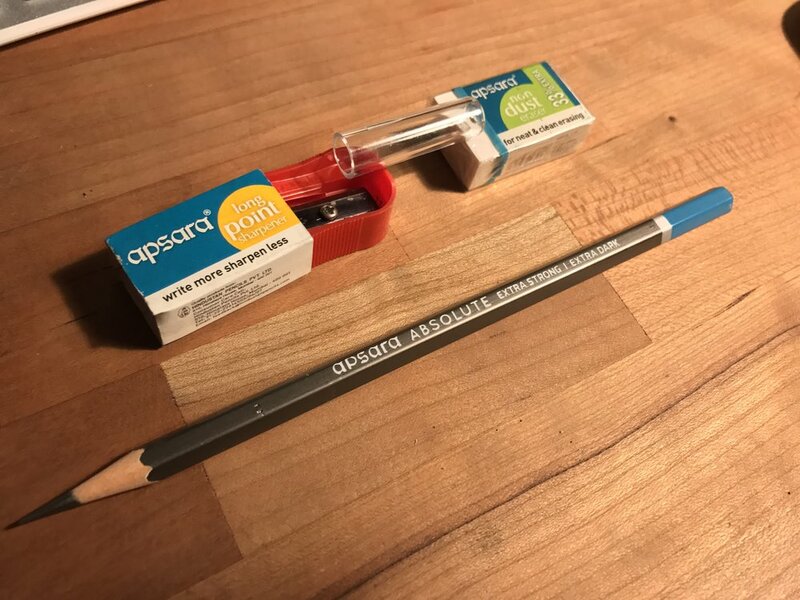 Like nearly every other Indian pencil I've seen, it comes in a box of 10 with a few extras: long point sharpener, non-dust eraser, and something new to this box, a plastic point protector. The blue on the box matches the end dip of these pencils and has a little foil reflective sheen to it. Hindustan makes a version of this pencil in various grades under their SiVO brand for Western markets, including a triangular version, which I would love to get my hands on. Unlike the Nataraj Deep Dark I reviewed last month, the Absolute is a stunning pencil from Hindustan Pencils. The dark gray lacquer is laid on thick atop a white primer. The imprint is just white paint, but it is applied perfectly, with no chipping or extra paint outside of the lettering. There is lettering on one side and the UPC on the other. The light blue end dip is separated from the dark gray with a fat, light gray stripe. In this instance, the two grays aren't super close in color. Overall, the lacquer is solid, thick, with no chipping around the unsharpened end and no paint drips or weirdly dried areas. Here's the extras that come in the box. The wood is a light in color and smell with no real visible grain. I'm through speculating on what wood a pencil is made of, unless it's obvious, like in the case of spotty jelutong or pungent cedar. I can't really tell much in this instance, other than the fact that it is light in color, though not white as the wood in a Ticonderoga. It's glued well enough that I couldn't find the seam. The wood sharpens easily, and the pencil even passes the picky Pollux test. The cores were all centered in this pack. According to the box, no forest wood was used, so I imagine that it comes from plantations, just like many other companies. The Absolute is billed as "Extra Strong | Extra Dark" and that is absolutely the case. These cores are thick, like a soft drawing pencil, yet hold their point well. The line they lay down is smooth and dark, around a B grade in my estimation. Though the line draws soft, the core is not, and won't chip or snap even when sharpened to a long point. It erases wonderfully with the included Apsara Non-Dust white eraser. Because of the light wood and lack of eraser, the Absolute is good in the hand, and it feels solid. As I mentioned in my Deep Dark review, it is heavier than some of the other Hindustan pencils, but I suspect that's due to the core and the use of a different wood besides jelutong. And while heavier, it's still not heavy. The matte finish of the lacquer is good in my sweaty mitts and doesn't slide out of my grip. The hex is not quite full, but not quite semi-hex, but sits somewhere in between. This is the best Hindustan Pencil Co. pencil I've found thus far. It checks most of the boxes for me: thick core, dark line, smooth, good point retention. Because I'm a Westerner, I'd love to see a version with an eraser, but as expand my horizons in the pencil game more and more, I'm finding that having an eraser matters less and less...it's just one more thing to carry around when taking it out and about. Also, I'm not a big fan of UPCs being printed on pencils, but I know why it's done and it's not a deal-breaker. I can overlook those minor things to have a pencil like this one...besides, it's a great candidate for a Hackwing! The very first one I made was with an Apsara Absolute, and I've made subsequent ones since. These are a great value at $5 for 10. I highly recommend this pencil. Available from Amazon, $5 for 10 pencils, plus sharpener, eraser, and pencil cap.